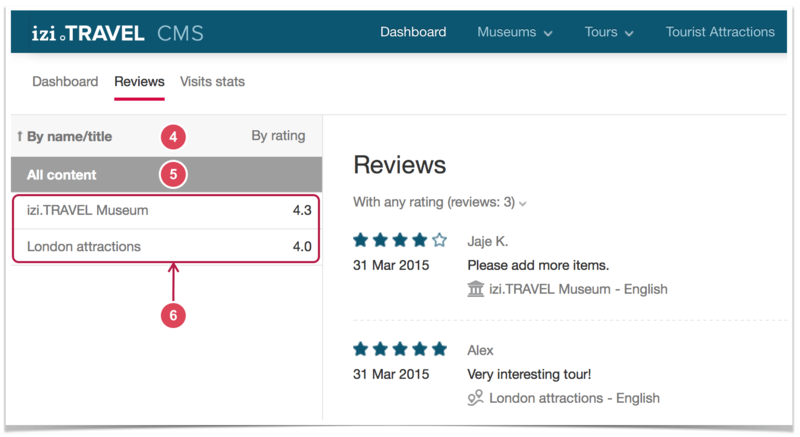 With izi.TRAVEL CMS you can see all museum and tour reviews and ratings submitted by moble application users. This information can be found in the «Reviews» section 1. The “Reviews” section consists of the list of objects (museums and tours) 2 and Reviews panel 3. The first element of this list is the sort bar 4. The list can be sorted by name/title or rating. The next element of the list is the «All content» button 5. The default setting is on. All objects (museums and tours) created by the content provider are placed under it 6. The object line contains the name and average rating of users. Highlighting the line of a specific object allows you to view information related to that object alone on the reviews panel. The “Reviews” panel displays reviews submitted by mobile applications users. By default, all user reviews of all objects are displayed. This information can be filtered by score using the filter 7 or by a certain object from the list of all objects 6. 12 – information about the reviewed object (icon, object name, language). This type of information can be found in the review block only if “All content” 5 is chosen. If a particular museum or tour is chosen in the list of objects, this line will only contain the language. Users’ reviews can be filtered using the filter 7. This element opens a list of star-rating options. The value “With any rating” is at the top of the list 13. The rating list may contain active 14 and inactive 15 elements. If there are inactive elements in the list, this means there are no reviews with such ratings. The selected filter is marked on the list with a tick. Information about the selected filter 16 and the number of corresponding reviews 17 is placed in the filter name. 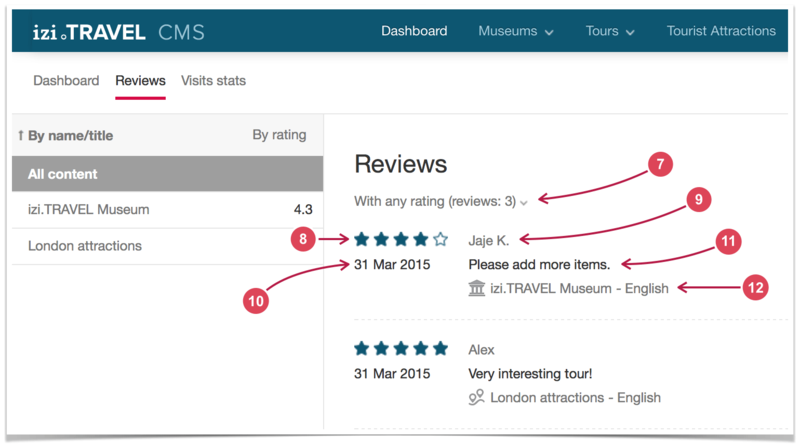 When you select a specific museum or tour object from the list, the reviews panel will only contain reviews related to that object. Unlike the all objects panel, specific reviews will not contain the object icon and name, and the panel itself will include the Rating block. 20 – the block of ratings distribution.